For any power setting and load condition, there is only one airspeed that gives the most efficient rate of climb. To determine this, consult the climb data for the type of helicopter being flown. The technique varies according to the airspeed on entry and whether a constant airspeed or constant rate climb is made. To enter a constant airspeed climb from cruise airspeed when the climb speed is lower than cruise speed, simultaneously increase power to the climb power setting and adjust pitch attitude to the approximate climb attitude. A helicopter may or may not have an exact “climb attitude.” To slow down to climb (versus cruise) airspeed, the nose must be raised. Depending on power and horizontal stabilizer configuration and effectiveness, the nose may be level during an established climb or slightly nose high. Many helicopters are very capable of climbing and never raising the nose. A short deceleration period may be necessary to slow to a more efficient climb airspeed, but the attitude indicator is often level after the climb is stabilized. The increase in power causes the helicopter to start climbing and only very slight back cyclic pressure is needed to complete the change from level to climb attitude. The attitude indicator should be used to accomplish the pitch change. If the transition from level flight to a climb is smooth, the VSI shows an immediate upward trend and then stops at a rate appropriate to the stabilized airspeed and attitude. Primary and supporting instruments for climb entry are illustrated in Figure 8-11. 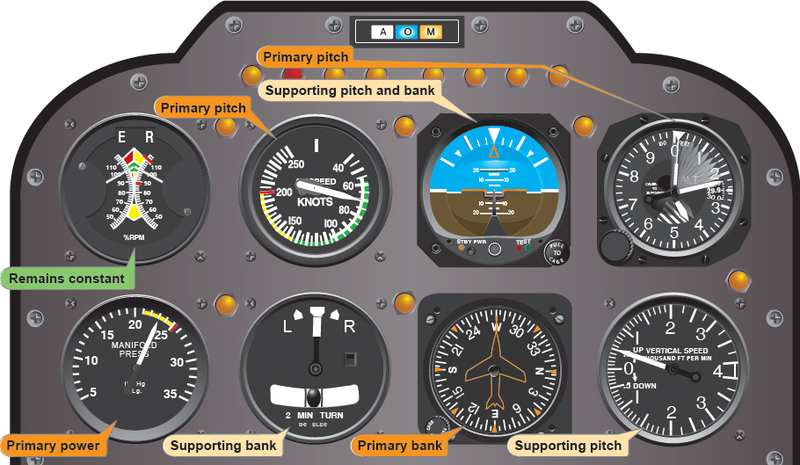 When the helicopter stabilizes at a constant airspeed and attitude, the airspeed indicator becomes primary for pitch. The manifold pressure continues to be primary for power and should be monitored closely to determine if the proper climb power setting is being maintained. Primary and supporting instruments for a stabilized constant airspeed climb are shown in Figure 8-12. The technique and procedures for entering a constant rate climb are very similar to those previously described for a constant airspeed climb. For training purposes, a constant rate climb is entered from climb airspeed. Use the rate appropriate for the particular helicopter being flown. Normally, in helicopters with low climb rates, 500 fpm is appropriate. In helicopters capable of high climb rates, use a rate of 1,000 fpm. To enter a constant rate climb, increase power to the approximate setting for the desired rate. As power is applied, the airspeed indicator is primary for pitch until the vertical speed approaches the desired rate. At this time, the VSI becomes primary for pitch. Change pitch attitude by reference to the attitude indicator to maintain the desired vertical speed. When the VSI becomes primary for pitch, the airspeed indicator becomes primary for power. [Figure 8-13] Adjust power to maintain desired airspeed. Pitch attitude and power corrections should be closely coordinated. To illustrate this, if the vertical speed is correct but the airspeed is low, add power. As power is increased, it may be necessary to lower the pitch attitude slightly to avoid increasing the vertical rate. Adjust the pitch attitude smoothly to avoid overcontrolling. Small power corrections are usually sufficient to bring the airspeed back to the desired indication. The level off from a constant airspeed climb must be started before reaching the desired altitude. Although the amount of lead varies with the type of helicopter being flown and pilot technique, the most important factor is vertical speed. As a rule of thumb, use 10 percent of the vertical velocity as the lead point. For example, if the rate of climb is 500 fpm, initiate the level off approximately 50 feet before the desired altitude. When the proper lead altitude is reached, the altimeter becomes primary for pitch. Adjust the pitch attitude to the level flight attitude for that airspeed. Cross-check the altimeter and VSI to determine when level flight has been attained at the desired altitude. If cruise airspeed is higher than climb airspeed, leave the power at the climb power setting until the airspeed approaches cruise airspeed, and then reduce it to the cruise power setting. The level off from a constant rate climb is accomplished in the same manner as the level off from a constant airspeed climb.